Tiny little crispy squares that make up this breakfast food serve to keep in place whatever fruit masterpiece you and your little one can create. Last week was hope to National Waffle Day, Aug. 24, which happens to be the anniversary of the first U.S. patent for a waffle iron. Granted to New Yorker Cornelius Swarthout, the patent for a device to bake waffles was granted in 1869. His early invention required the use of a coal stove and simple offered a griddle with a cover that required flipping to cook both sides. While this patent inspired the national holiday, it is far from the beginning from this cherished breakfast treat. In honor of all things waffle, and getting a good, healthy start to your morning, we’re going to make the crispy, delicious breakfast food this week. Altering a recipe from MrBreakfast.com, sift together 2 cups of flour, 3 tablespoons of sugar, 2 tablespoons of baking powder and a ½ teaspoon of salt then set aside. In a small bowl, beat 2 egg whites until stiff, then set aside. In a medium bowl, beat the two egg yolks well. Then stir in 1 ¼ cup of milk. Add sifted dry ingredients to egg yolks and mix until moistened. Be careful not to over mix! Add 1/3 cup vegetable oil then folk in the egg whites. Lastly, add 1 cup of freshly-washed blueberries into the mix. Preheat any waffle maker for at least 4 to 5 minutes, then put your batter in. You’ll know the waffles are down when they’re crisp and brown. You may want to slice some peaches to put on top. The waffles you’re about to make can be traced back to the 13th Century when ancient Greeks would cook flat cakes between two metal plates. They preferred topping the morning meal with cheeses and herbs. 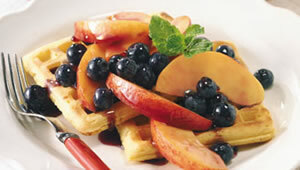 The modern waffle originated with a wafer, very light thin crisp cakes baked between wafer irons in the Middle Ages. They made the crispy food by using two metal plates connected by a hinge with each plate connected to a wooden handle. It was placed over a fire and flipped to cook both sides. By the 14th Century, street vendors called waferers began selling wafers. Even the common spelling of waffles took some time. Pilgrims brought Dutch wafles to America in the 1600. The word waffle, specifically with two f’s, didn’t appear in English print until 1735. Long after he served as president, Thomas Jefferson brought a long-handled, pattered waffle iron to the U.S. after a trip to France. Moms could start relying on frozen waffles in 1953 when Frank Dorsa’s Eggo appeared in supermarkets. Did you know the Eggo was invented in San Jose? The great thing about waffles is the endless possibilities. Change up the fruit depending on what’s in season to create new flavors, and new family favorites.